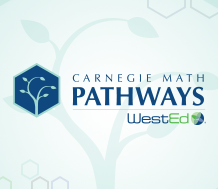 Today, the Carnegie Foundation for the Advancement of Teaching announced that its Carnegie Math Pathways program will transition to WestEd: a large-scale education nonprofit well-suited to accommodate the network’s burgeoning growth. Carnegie Math Pathways is the first program of its kind to transform math remediation in community colleges across the country. The Carnegie Math Pathways program includes two alternative standards-based math sequences called Statway and Quantway, which allow students to enroll directly into college-level math with built-in remediation of necessary math skills. Math remediation policies are the single largest barrier to increasing college completion and a key driver of racial and other achievement gaps. Carnegie Math Pathways give students access to rigorous, college-level math that is relevant to their goals, ensuring that arbitrary and failed remediation policies don’t delay or derail students’ education. In response to robust growth and demand from new institutions, Carnegie identified WestEd as the best-suited organization to support and grow the network. A large, national research and service organization headquartered in San Francisco, WestEd has a proven track record in providing professional development services and technical assistance to thousands of schools and colleges in every state. WestEd’s deep experience and relationships in the field will enable Carnegie Math Pathways to continue the outstanding level of support to participating colleges while growing the network. The Carnegie Foundation will also continue to play an essential role in the daily operations of Math Pathways through an ongoing partnership that’s critical for innovation and research. Carnegie Math Pathways served more than 10,000 students in 2016, and this year more than 70 institutions in 17 states will offer Statway and/or Quantway. These alternative pathways replace community colleges’ traditional algebra sequences with real-world, standards-based applications like statistics, aligning coursework with students’ program of study and accelerating their progress through their college-level courses. New data show that Statway and Quantway students go on to earn more college level credits, and graduate and transfer at significantly higher rates than their peers, demonstrating the rigor of the approach. Education leaders say these programs provide a model schools across the country should consider adopting. The increased demand, they say, shows institutions are taking notice. Studies show that Statway students complete college math at triple the rate of those in the traditional sequence, and do so in half the time — across all racial and ethnic groups. Statway students also go on to earn more college credit than their peers in remediation, and transfer to 4-year institutions at higher rates. Carnegie Math Pathways is a network of faculty members, researchers, designers, students, and content experts working to empower all students to reach their college and career goals by transforming their mathematics learning experience. For more information on the Pathways (Statway and Quantway), visit CarnegieMathPathways.org. The Carnegie Foundation for the Advancement of Teaching is committed to developing networks of ideas, individuals, and institutions to advance teaching and learning. We join together scholars, practitioners, and designers in new ways to solve problems of educational practice. Toward this end, we work to integrate the discipline of improvement science into education with the goal of building the field’s capacity to improve. For more information about the Carnegie Foundation, visit CarnegieFoundation.org. WestEd is a nonpartisan, nonprofit research, development, and service agency working with education and other communities to promote excellence, achieve equity, and improve learning for children, youth, and adults. For more information about WestEd, visit WestEd.org.